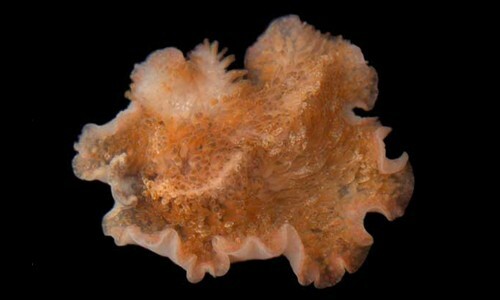 Invertebrates are animals without a backbone. Some, like oysters and blue crabs, are easy to recognize. But others like worms and copepods, some of the most abundant animals in the Bay, are rarely seen by humans. 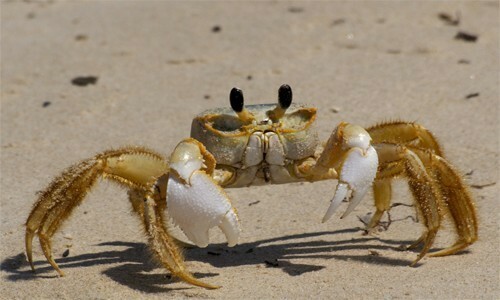 Also known as the sand crab, the Atlantic ghost crab is a sand-colored crustacean with a distinct pair of white claws. Ghost crabs are active on coastal beaches in the Chesapeake Bay region from spring through autumn. 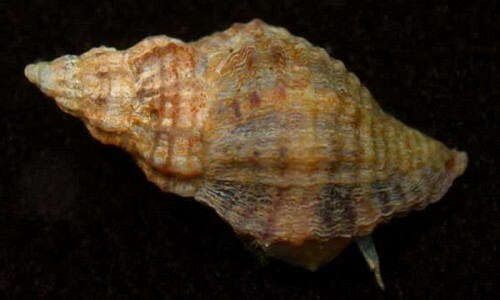 The Atlantic oyster drill is a small, predatory snail with a pointed, ribbed shell. It lives on reefs, rocks and pilings throughout the middle and lower Chesapeake Bay. 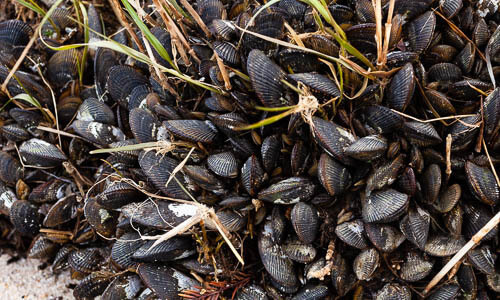 The Atlantic ribbed mussel is a bivalve with dark, ribbed shells. It is found in low marshes and mud flats throughout the middle and lower Chesapeake Bay. 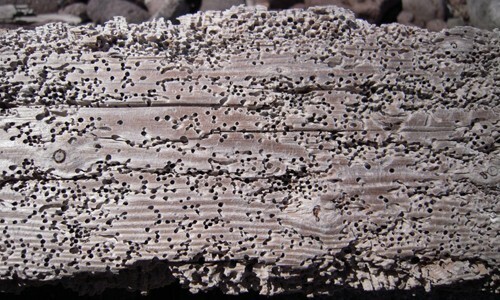 Barnacles are small, grayish-white crustaceans that live on rocks, pilings, boat hulls and other hard surfaces throughout the Chesapeake Bay. 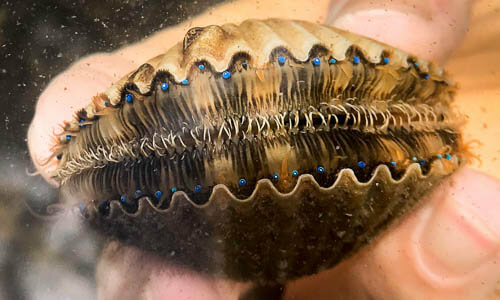 The bay scallop is a bivalve that lives in the lower Chesapeake Bay’s salty, shallow waters. 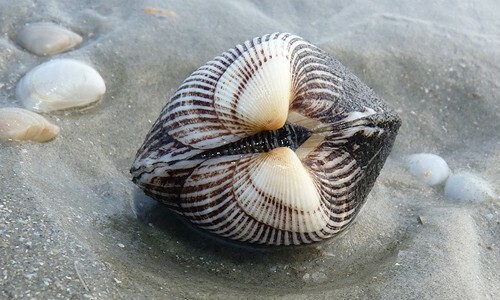 Its ribbed, multicolored shells are often found on beaches throughout the lower Bay. 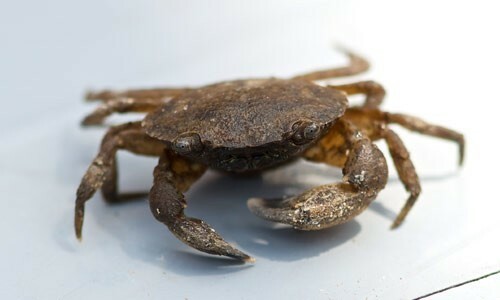 Also known as the Atlantic mud crab, the black-fingered mud crab is muddy brown in color with stout, black-tipped claws. 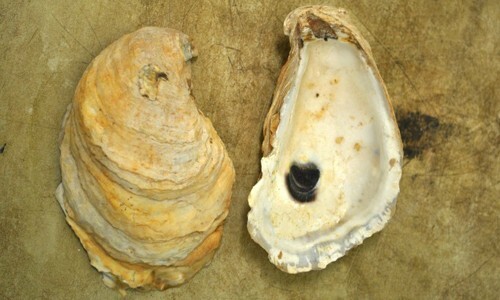 It can be found on oyster reefs and along the muddy bottoms of marshes. 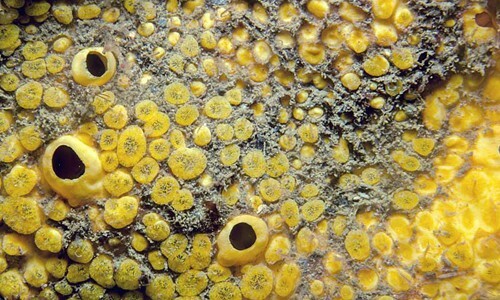 The boring sponge is a thick, bright yellow sponge that grows on oyster reefs throughout the Chesapeake Bay. 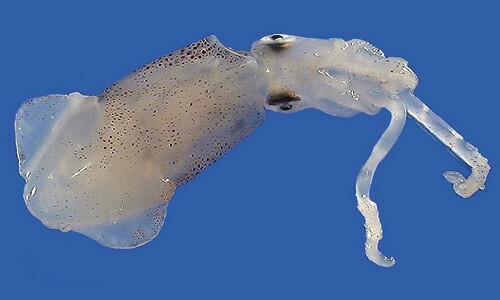 The brief squid is a small, free-swimming mollusk with a soft body and arm-like tentacles. It lives throughout the lower Chesapeake Bay. 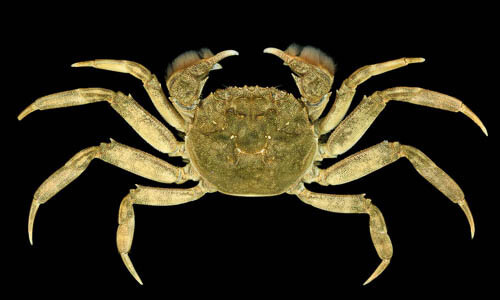 The Chinese mitten crab is a light brown crustacean with a distinct pair of hairy, white-tipped claws. Native to East Asia, the invasive species has been reported in small numbers in the Chesapeake Bay. Comb jellies are transparent, jelly-like invertebrates with bright, iridescent color bands. They live near the water’s surface in the middle and lower Chesapeake Bay. 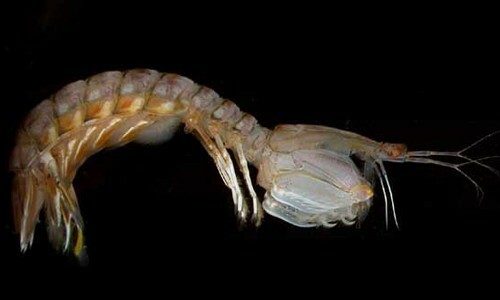 The common grass shrimp has a delicate, nearly transparent body with a distinctive serrated “horn” over the eyes. It lives in shallow waters throughout the Chesapeake Bay and its rivers. 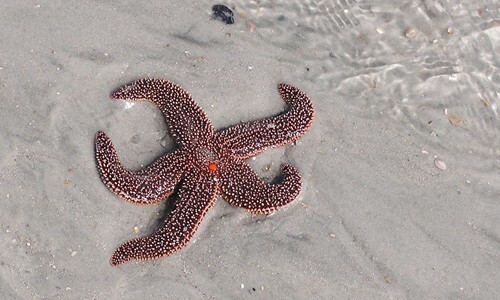 The common sea star is a spiny-skinned echinoderm with five pointed arms. It lives mainly on rocks, jetties and pilings in the shallow, salty waters of the lower Chesapeake Bay. 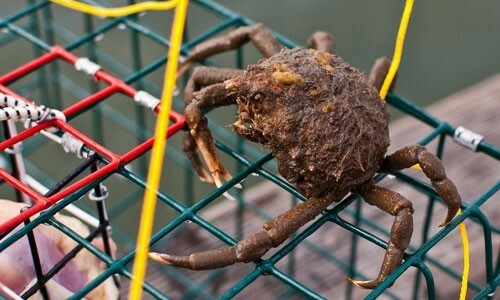 Also known as the portly spider crab or the nine-spined spider crab, the common spider crab is a long-legged and slow-moving crustacean that covers itself in algae and small debris as a defense against predators. The deer tick—named for its preferred host, the white-tailed deer—can carry and transmit to humans the bacteria that causes Lyme disease. 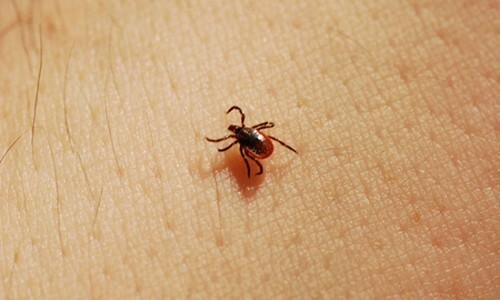 Ticks are most active in late spring and summer. 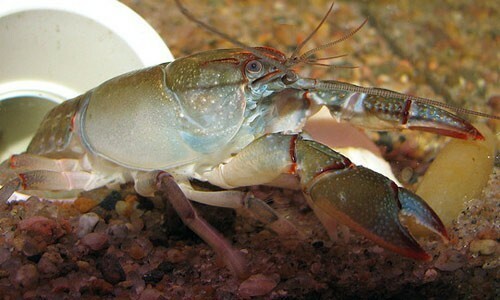 The devil crayfish is a brownish red crustacean that resembles a miniature lobster. They typically have red-tipped claws. They can be found burrowing in forested areas where the water table is near the surface. 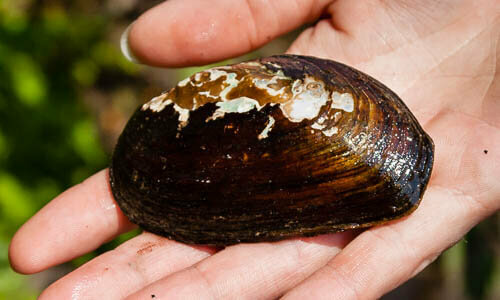 The eastern elliptio is a freshwater mussel that can be found throughout the Chesapeake watershed. 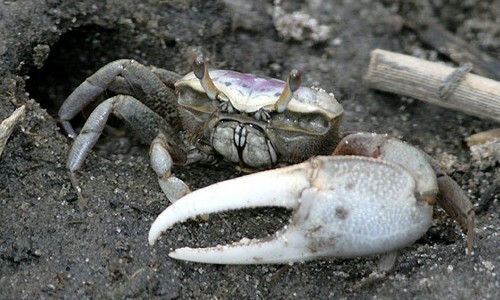 Fiddler crabs are small crustaceans with a distinctive enlarged claw. They live on beaches, mud flats and marshes throughout the Chesapeake Bay. 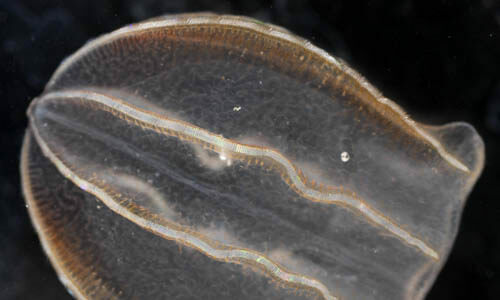 Flatworms are tiny, leaf-shaped worms that live among reefs, jetties and eelgrass meadows in the shallows of the middle and lower Chesapeake Bay. The ghost anemone is a jelly-like invertebrate with a flat, rounded base and stinging tentacles at the top of an elongated stalk. It lives on rocks, reefs, pilings and other hard surfaces throughout the Chesapeake Bay. Gould’s shipworm is a bivalve with a long, worm-like body. 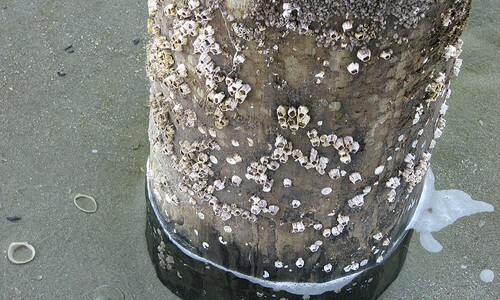 It lives within untreated wood, such as pilings and driftwood, in the middle and lower Chesapeake Bay. 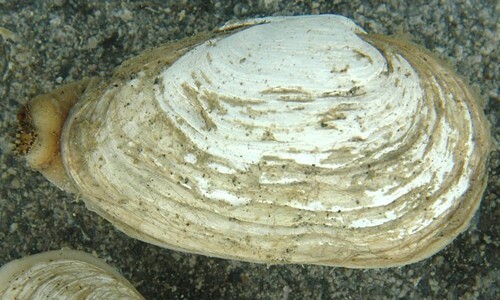 The hard clam is a bivalve with thick, ridged, rounded shells. It lives in the salty waters of the lower Chesapeake Bay. 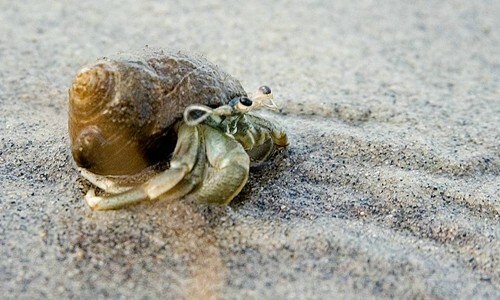 Hermit crabs are small crustaceans that lack a shell and must “borrow” one from another animal. 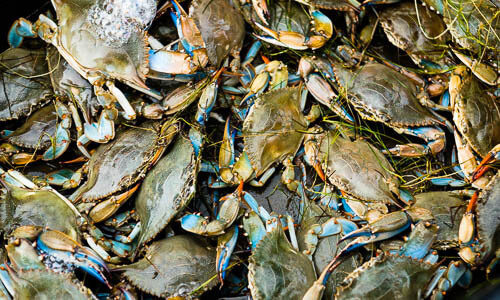 They live on beaches, mud flats and shallow waters throughout the lower Chesapeake Bay. 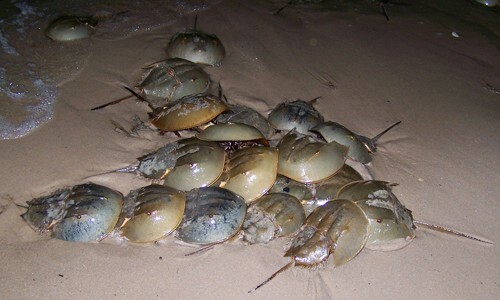 The horseshoe crab is a primitive-looking arthropod with a hard, brownish-green exoskeleton and a spike-like tail. It visits the Chesapeake Bay’s sandy beaches each spring and summer to spawn. 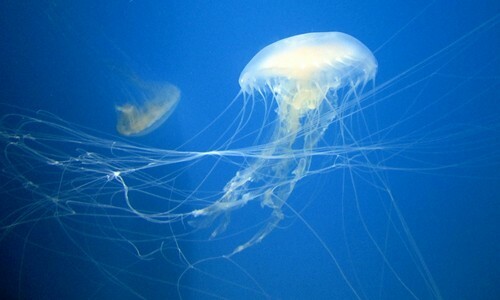 Jellyfish are floating animals with gelatinous, umbrella-shaped bells and stinging tentacles. 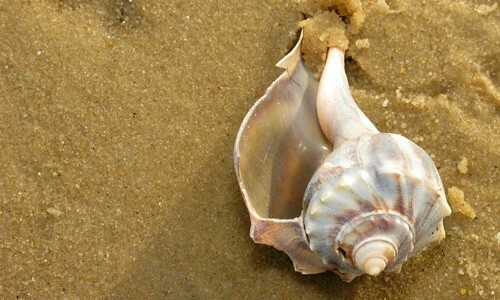 Knobbed whelks are marine gastropods that live in tidal estuaries along the Atlantic coast. 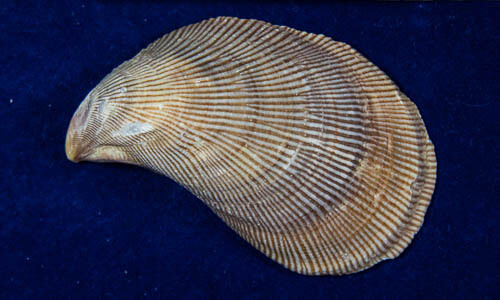 Their spiral shells can range in color from grayish white to tan. 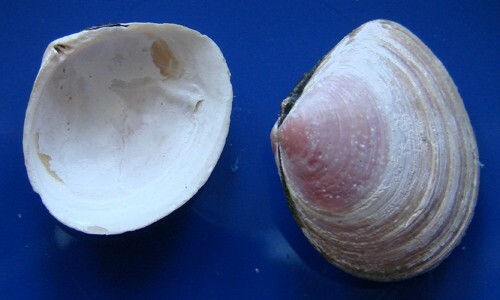 Macoma clams are tiny bivalves with thin, chalky white shells. They live buried in the sand or mud in the shallow waters of the middle and lower Chesapeake Bay. The mantis shrimp is a crustacean with a flattened, segmented body and praying mantis-like claws. It burrows within muddy flats along the shoreline of the middle and lower Chesapeake Bay. 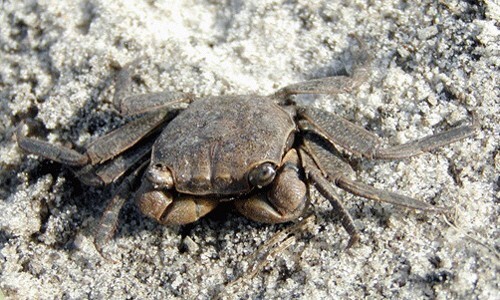 The marsh crab is a small shore crab that lives in salt and brackish marshes in the middle and lower Chesapeake Bay. 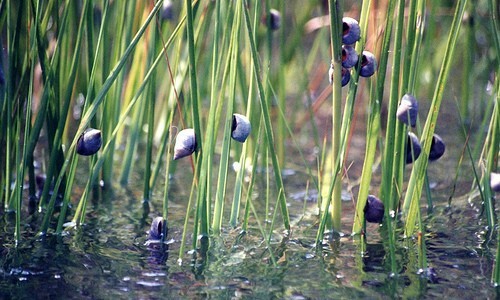 The marsh periwinkle is a small snail with a thick, spiraling shell. It lives in tidal marshes and wetlands throughout the middle and lower Chesapeake Bay. 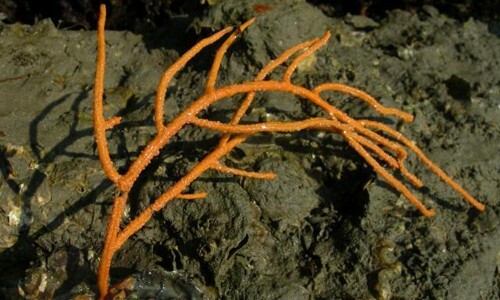 The red beard sponge is a brightly colored sponge with thick, intertwining branches. It lives on rocks, reefs, piers, pilings and other hard surfaces in the middle and lower Chesapeake Bay. 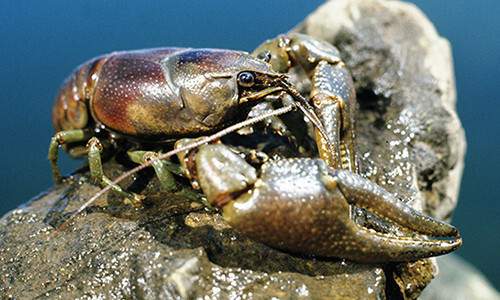 The rusty crayfish is an invasive species that can be found in some rivers and streams in Maryland, New York, Pennsylvania, Virginia and West Virginia. It has a spot on either side of its back that is rusty in color. 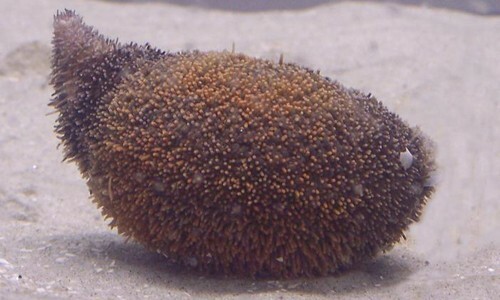 Sea cucumbers are echinoderms with elongated, spiny-skinned bodies. 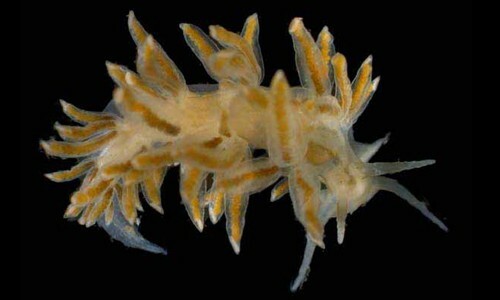 They live at the bottom of the lower Chesapeake Bay’s deep, salty waters. 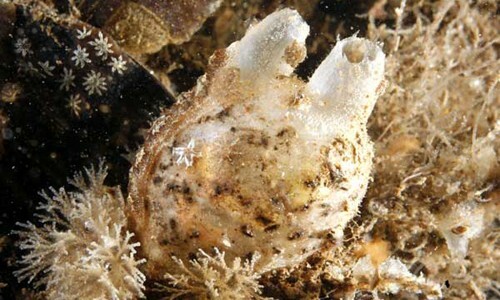 The sea squirt is a tunicate with a rounded, leathery body and two short siphons. It lives on reefs, pilings and other hard surfaces in the shallow waters of the middle and lower Chesapeake Bay. 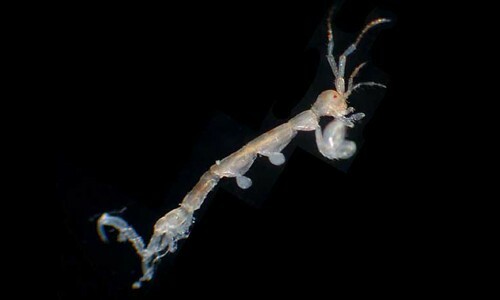 Skeleton shrimp are tiny, gangly amphipods with transparent, stick-like bodies. 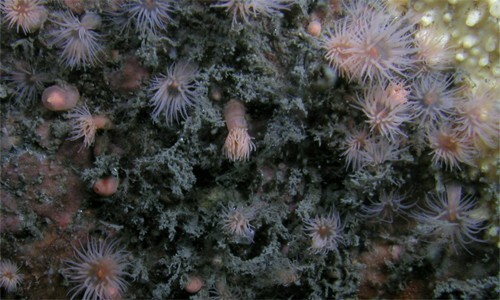 They live attached to hydroids, sponges and vegetation in the middle and lower Chesapeake Bay. 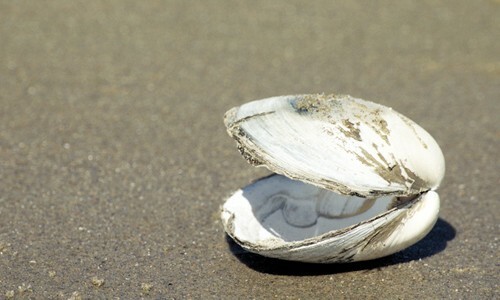 The soft shell clam is a bivalve with thin, elongated shells. 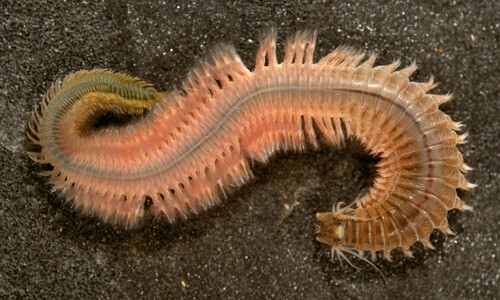 It lives buried in soft sediments in the middle Chesapeake Bay. 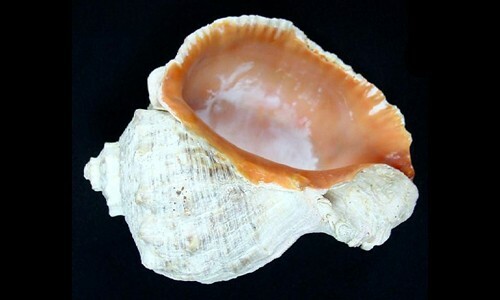 The veined rapa whelk is a large, predatory snail that lives in the lower Chesapeake Bay. It is an invasive species. 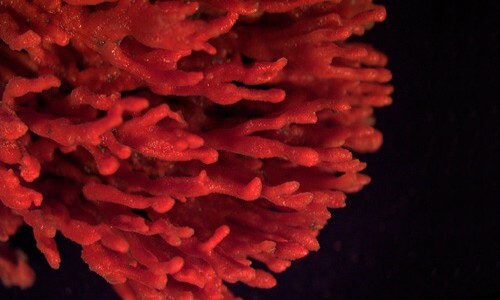 Whip coral is an invertebrate with long, whip-like branches covered in tiny polyps. It lives on rocks, reefs and other hard surfaces throughout the lower Chesapeake Bay. 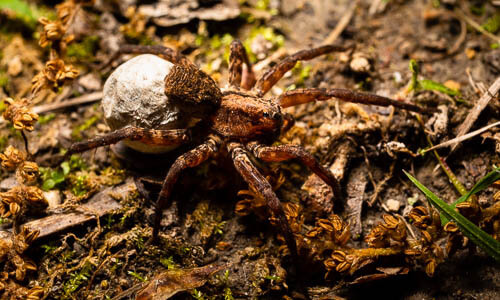 Pardosa milvina is a common species of wolf spider. They are black or brown with lengthwise stripes and long, thin legs. 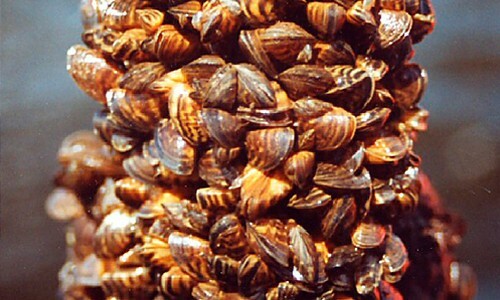 The zebra mussel is a tiny bivalve with zebra-like stripes on its triangular shell. 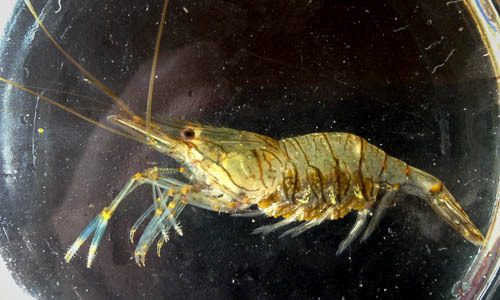 It lives in freshwater lakes, rivers, streams and reservoirs in parts of the Chesapeake Bay watershed. It is a non-native and invasive species. 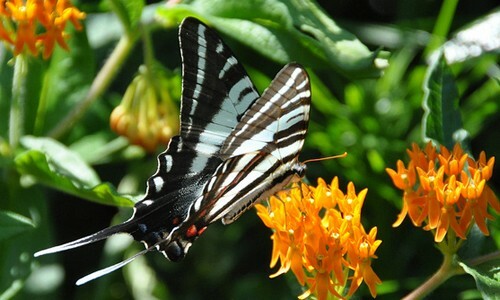 The zebra swallowtail is a butterfly with thick, black stripes on its white wings. It lives in moist, low woodlands where its host plant, the paw paw tree, grows.